The Trojan Athletic Fund was founded in 1923 to provide the funding necessary to sustain the excellence of USC athletics’ varsity sports. Since then, the Fund has grown to support 21 NCAA sports and more than 650 student-athletes. The members of the Trojan Athletic Fund form a global group of more than 6,000 alumni, parents, former student-athletes, and friends who directly contribute to the success of our student-athletes. The Trojan Athletic Fund values each and every one of its members. There are several ways that you can actively support the success of our student-athletes and we are grateful not only for your financial generosity, but for your engagement as well. Here are just a few ways in which you can support the young men and women of Troy. Heritage Association: The Heritage Association is the strongest network of student-athlete alumni in the world. All members are asked to make a donation each year to keep their membership active. It’s also important that we have your up-to-date contact information. Many of our student-athletes have gone on to have successful careers outside of athletics and still make the time to stay involved with the athletics program. Through both engagement and philanthropy, the Heritage Association will provide the best possible resources for our coaches and student-athletes to compete at the championship level both on the field and in the classroom. Women of Troy: A Women of Troy membership directly fund our women’s athletics program and gives you several benefits. The WOT have one of the most storied athletic histories in college history, with a total of 29 national championships, third in the nation. A gift to support our female student-athletes is an investment that helps ensure their bright futures. The academic success of the WOT is especially worth celebrating. At the end of the 2017 school year, 9 out of 11 women’s teams had an overall semester GPA over 3.0. TAPA: The Trojan Athletic Parents Association was formed to bring together student-athlete parents in support of all 21 USC teams. Members receive an exclusive newsletter informing them of USC Athletics and TAPA events and developments. They also have access to the Pre-Game Football Picnics and other exclusive events. USC is, without a doubt, one of the finest academic institutions in the country—and it has an athletic heritage like no other. 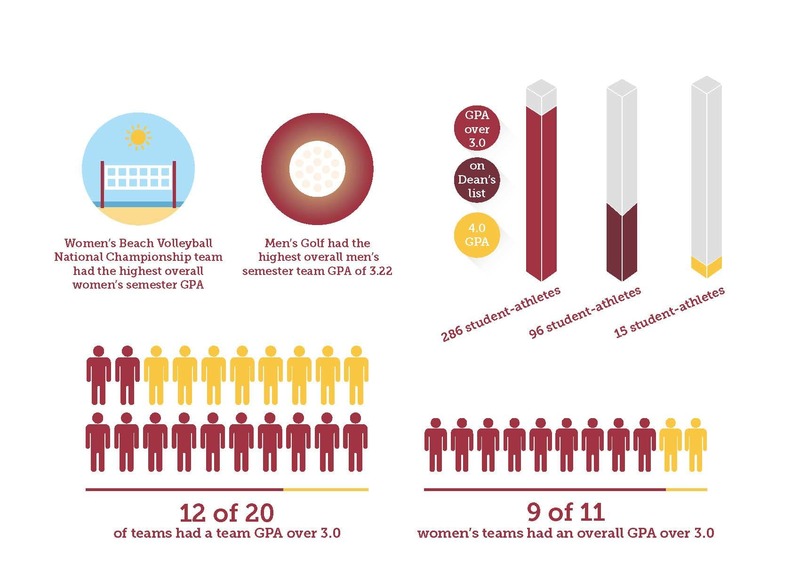 USC’s student-athletes, however, are more than just champions in their respective sports – they are champions in the classroom as well. The Stevens Academic Center is home to some of the best academic support staff and resources in college athletics. For the fourth consecutive year, the Graduation Success Rate (GSR) of USC student-athletes hit an all-time high at 86%, no small feat for attending one of the top 15 ranked universities in the nation. 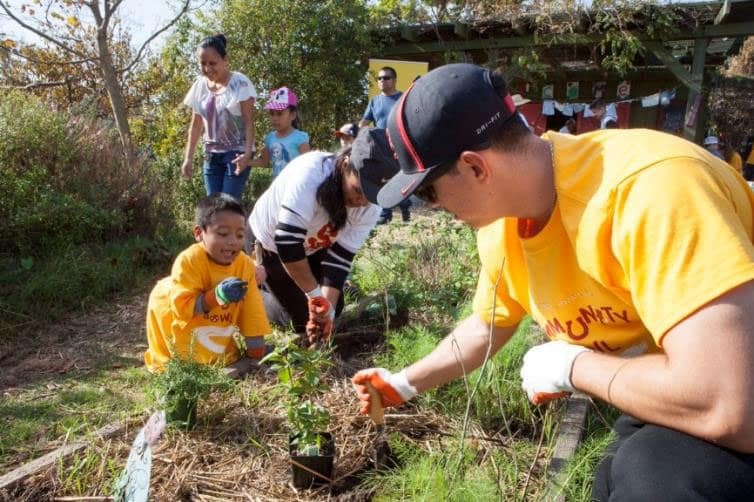 Community Service: In a city as diverse as Los Angeles, there is never a shortage of opportunities to serve. 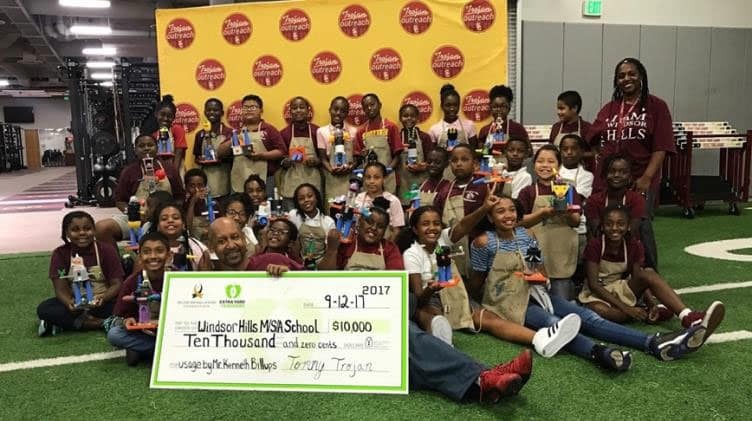 For the 2017-2018 academic year, Trojan Outreach worked diligently with 650 student-athletes who will have compiled, to date, over 2800 hours of volunteering to a myriad of causes and initiatives throughout the “City of Angels”. Student-athletes continue to provide events and services to vulnerable populations that are vetted for need and who might not otherwise have access to those services. The impact of our reach covers cross-sectional issues that face residents of Los Angeles country. Read about a few of our community service projects here and here. The USC Athletic Department follows four basic principles: to promote the well-being of student participants; to attain and maintain competitive excellence; to administer clearly, openly and responsibly; and to support the overall goals of the USC community. By following these principles, the department is able to ensure your generosity directly contributes to the academic and athletic success of our student-athletes. With your help, we can ensure that these principles continue to guide us as we provide meaningful assistance to our student-athletes.